Beaconsfield Town Council already had an existing play facility at Holtspur Way which included a traditional equipped play area, a multi -use games area and some outdoor gym equipment, but wanted to improve this facility with new equipment for teenagers which would include some static fitness equipment. Play and Leisure were asked to put forward a design to engage local teenagers with the Town Councils plans. After consultation with the teenagers the following equipment was chosen to be supplied and installed by Play and Leisure. A 25m Aerial Runway, a Whirlwind Overhead Rotator, Nemesis Activity Unit from the Quest range, a Velocity Basket Swing and a Zone Fitness Station. 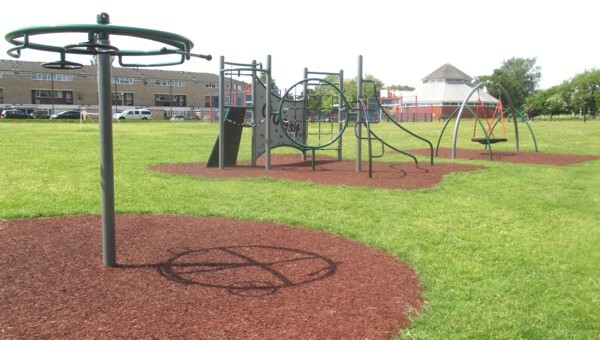 All the equipment was to be installed into grass with rubber bonded mulch surfacing. Work commenced in early March and was completed later that month in time for the Easter beak much to everyone’s delight and within the £36,000.00 budget.